There are many haunted tales associated with the Chislehurst Caves located in Chislehurst Kent in the United Kingdom. Most of these stories revolve around the many stories of murder and sacrifice associated with humans that are said to have occurred in the cave. These caves are said to be man made and have a history that expands over a period of approximately eight thousand years. In this haunted places to go article guide, you will learn about the history and haunted tales of these mysterious and dark caves located in Kent, United Kingdom. The caves originally started, it is believed, as an area that served miners.. The individuals who wandered into the saves in the earliest days discovered substances that could be used in order to enhance the overall quality of their lives. These substances included chalk and flint. The caves have been measured and it has been determined that there are just over twenty miles of passageways when you add up the total area of all the tunnels. As World War Two erupted, many individuals discovered a new use for the Chislehurst Caves. Several people started flocking to the caves in order to experience protection from the guns and violence that erupted in the grounds above. During the time of the war, it is believed that over fifteen thousand individuals flocked to the tunnels and dark passageways of the cave in order to live, socialize, and go day to day without being hit by a bullet or caught in an explosion. The people adjusted rather well to the extremely densely populated cave, and even incorporated a medical area where the sick and injured could be treated. Unfortunately, medical treatment did not come in time for many people. As a result, they died within the walls of the cave. It is believed, to this day, that the spirits of these souls still linger throughout the dark passageways of the Chislehurst Cave. Many individuals who have experienced the cave for themselves often share the experience of hearing and even seeing the spirits of children. Sounds of playful laughter and talking of children seems to echo from the walls of the cave. Many individuals have witnessed the sounds of mournful crying from children. For many, there were spirits of children that appeared in the form of full body apparitions, as well as mists. While the children do not appear to want to harm anyone, experiencing their unforeseen or even seen presence in the dark passages can be quite overwhelming – regardless of who you are. 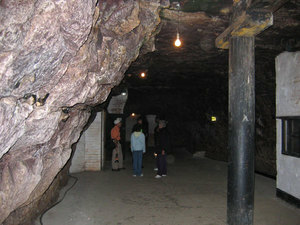 The owners of the caves offer tours to interested individuals during the daytime hours. Private evening tours are available to clubs or groups. Throughout the cave, there are several mannequins placed in order to give people the feel for how people used the caves during the time of the Second World War. Many claim that these human like replicas seem to move on their own. It is not uncommon for the individuals who give the tours to find that one of the mannequins has been moved from its location, or to actually see the movement themselves. Many unusual sounds and visual oddities have been experienced in the haunted Chislehurst Cave. Many have heard what they believe to be footsteps, voices, screams, cries and more. For this reason, the “Challenge” had been set up. This was a contest that “dared” someone to stay in the cave overnight, on Halloween. The winner, of course, would win money and recognition for their efforts. Unfortunately, by the time a person resided in the caves for just a few hours, and were subjected to a large number of paranormal events, they were ready to escape with little concern for the cash reward and recognition. The "Challenge" was stopped do to safety concerns. If you are searching for haunted places to go, try out the Chislehurst Cave. You must have at least one partner and be quite careful about which path you take. If you want to experience the same fear that so many who have been exposed to this cave have experienced, this is a wonderful opportunity to experience.